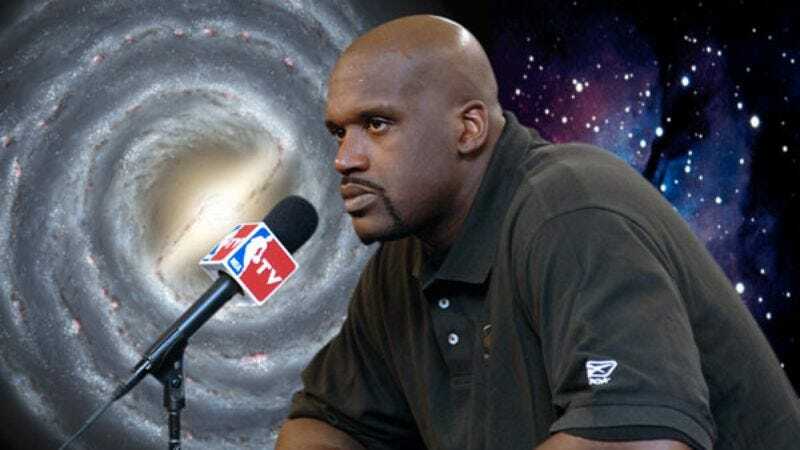 The former league MVP said he began reading about supernovas upon being informed by his 7-year-old son Shareef that the sun is actually a star, a fact that O'Neal said "intrigued [him] greatly." Upon further research, O'Neal was reportedly shocked by the possibility that carbon fusion could be ignited within the team's center, causing an explosion that could exceed over 100 billion Kelvins in temperature. "I have been involved in many hotly contested battles in my playing career and have come out an even stronger warrior, but 100 billion Kelvins is a lot even for the Diesel," O'Neal said, showing the various media present a slide of the Crab Nebula, which he called a "frightening" example of what could be left of him after a supernova occurs. "If I were still in my 20s, maybe I could sustain a burst of energy more powerful than the sun could emit over a 10-billion-year time period. But Steve Nash has to understand that I have a bad hip." O'Neal also added that he did not feel threatened by or feel any animosity toward Nash, who O'Neal believed would not have sufficient mass or power to become a supernova and who would instead cool slowly before degenerating into a white dwarf. Though O'Neal has reportedly told Phoenix Suns coach Mike D'Antoni that he refuses to set foot on the U.S. Airways Center court until he is guaranteed that the arena will not collapse on itself at speeds of 70,000 kilometers per second, he informed Phoenix general manager Steve Kerr by telephone late Monday that if a supernova could not be avoided, he would consider playing with the team if he at least knew what type of stellar explosion he could expect. "There are five types of supernovas," O'Neal said. "I told Steve that if I have to endure one of the five, I would prefer the Type 1c, which has weak or no helium lines and no strong silicon absorption features near 615†nanometers. The worst would be the Type 1b, which is characterized by non-ionized helium. I made it perfectly clear that, with all that I've done for this league, a neutrino-heavy Type 2L is simply unacceptable." Early reports indicate that O'Neal was willing to compromise when he learned no other NBA team had any interest in the oft-injured athlete. "I'm still the most dominant player in the game," O'Neal said. "I'm still a big star. But people must realize that, since I am as big as eight conventional stars, the risk of me going supernova is that much greater." When asked if there were other teams that frightened O'Neal as much as the Suns, the 14-time All-Star said he would retire immediately if he were ever traded to the Utah Jazz.